I loved these sweet and sour vegetables since the first time I prepared them. My children don’t like vegetables that much but I don’t mind – I ate it all by myself…while my husband was still deciding if he wanted them or not! Sometimes we think that the sweet and sour is too drastic, or too oriental for a normal meal. But we are wrong. This recipe proves it. It is perfect as a side, or for a single lunch (I love to cook these kind of recipes when I am by myself for lunch). Obviously these sweet and sour vegetables are a vegetarian recipe, and can become even vegan if you use only olive oil, leaving aside the butter (even if I believe I prefer it with butter). You can use the vegetables you prefer. 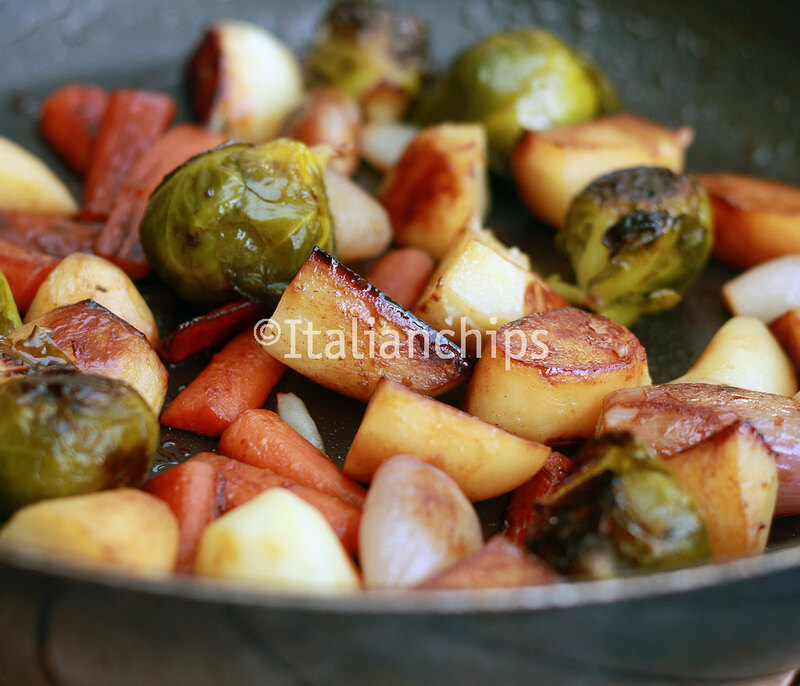 I chose potatoes, carrots, shallots and brussel sprouts (that I admit I had never eaten before using them for this recipe). For me it’s a perfect match, but use the vegetables you prefer…or have in the fridge. 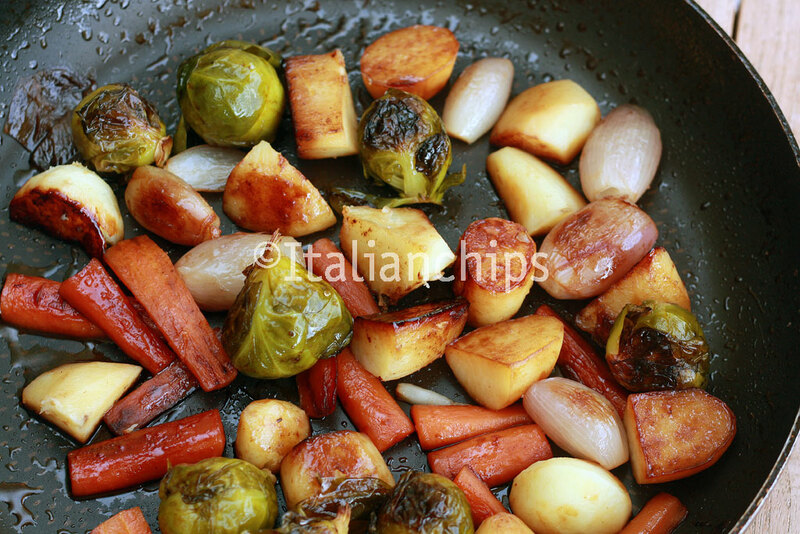 This recipe is from an Italian food blogger I like, Csaba della Zorza. She is more specific than me, as she uses young vegetables. I believe they may be even better, but as always, I tend to be practical and use what I have under my hands (or available at my supermarket). Peel and cut all the vegetables in pieces. Put the oil and the butter into a large pan and turn on the gas (medium). When the butter is melt, add the carrots. Then the potatoes, the shallots and the other vegetables you have. As soon as they color, pour the vinegar, let it evaporate and add the sugar. 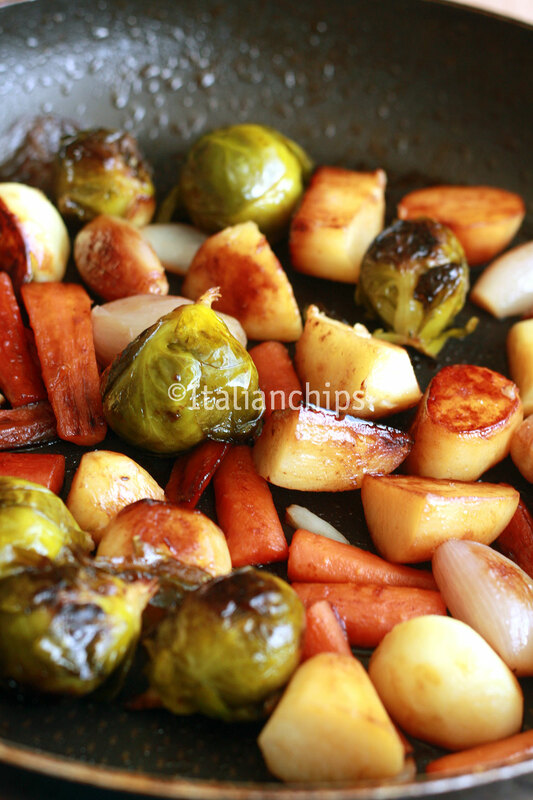 Let them cook for 15 to 30 min, depending on the kind and size of the vegetables, with a tap. Move the pan every now and then to mix the glaze, adding a Tbsp of water if needed, or just taking off the tap if it's too liquid.